The United States Mint reported a decline in numismatic program revenue for the fiscal year ending September 30, 2010, citing fewer precious metals products and poor economic conditions. Despite, the 6.11% decline in overall revenue, net income and seigniorage rose by 21.17% due to a shift to higher margin products. This article will conclude coverage of the 2010 United States Mint financial results, which separately examined bullion program, circulating coin shipments, and the numismatic program. The US Mint manufactures a variety of numismatic products, which are offered for sale directly to the public. This includes proof and uncirculated coins, annual and other collector sets, commemorative coins, and bronze medals. The purpose of the program is to make numismatic products accessible, available, and affordable to the American public. The program is managed to a net margin at or below 15%. For the latest fiscal year, sales revenue for the numismatic program was $413.1 million, down 6.11% from the $440.0 million achieved in the prior year. Revenue was down more than 25% from the recent peak of $557.2 million recorded for the 2008 fiscal year. Net income and seigniorage rose 21.17% to $49.8 million, representing a net margin of 12.1%. Excluding the seigniorage portion, net income was up more than 73% from the prior year. The US Mint breaks down their total numismatic program revenue into six different categories. Recurring: This includes high quality versions of circulating coinage that are specially packaged. Examples include annual sets, America the Beautiful Quarters Proof and Uncircualted Sets, and Presidential Dollars Proof and Uncircualted Sets. Ultra High Relief: During the 2009 calendar year, the US Mint issued the 2009 Ultra High Relief Saint Gaudens Double Eagle. 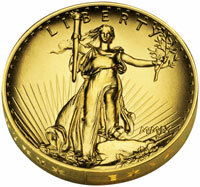 This one ounce 24 karat gold coin recreated one of the most beautiful US coins in history. American Eagle: This includes collectible proof or uncirculated versions of the American Gold Eagle, American Silver Eagle, and American Platinum Eagle. American Buffalo: This includes collectible proof versions of the American Gold Buffalo. Currently, the US Mint only offers a single one ounce proof version for each year. Commemorative: Congress authorizes programs to honor people, places, or events important to the country. Prices include surcharges payable to recipient organizations, which are not reflected in revenue figures. Numismatic Sale of Circulating Coins: The US Mint packages certain circulating coins for sale through numismatic channels. Seigniorage generated from these sales is transferred to the Treasury General Fund. Revenue recorded for recurring products dipped slightly from the prior year, however net income for the category grew to $21.2 million compared to $9.9 million in the prior year. The United States Mint raised the prices for most 2010-dated annual products despite a reduction in the number of coins included in each set. This combination of higher prices and lower input costs resulted in higher margins. The Ultra High Relief Gold Coin was only available for one quarter during the fiscal year, accounting for the drop in revenue. Across all impacted fiscal years, the US Mint generated $147.5 million in revenue and $4.1 million in net income from the offering. The majority of revenue for American Eagles was derived from the offering of the 2009 Proof Platinum Eagle. As the US Mint diverted planchet supplies to bullion coins, collector versions of the American Gold Eagle and Silver Eagle were not available during most of the fiscal year. The 2010-dated versions were finally released in the first quarter of the following fiscal year. American Buffalo revenue jumped since the US Mint released both the 2009 and 2010-dated proof coins during the 2010 fiscal year. Net income attributed to this category was $12.7 million, representing a margin of 10.9%.